I know I post a lot of biscotti recipes, and here's another one. I'm going to a pumpkin-themed pot-luck tonight, so I adapted my favorite biscotti recipe to have pumpkin and chocolate chips instead of plain with pecans. They worked, and are delicious. Preheat oven to 350, and grease a loaf pan. Combine the rice flour mix, almond flour, xanthan gum, salt, baking powder, cinnamon and ginger. Set aside. Cream the butter with the sugar, then add the vanilla, then eggs, then pumpkin. Stir in the dry mix, fold in the chocolate chips, and scrape batter into the pan. Bake for 50 minutes to an hour, cover with a damp paper towel, then foil, and let cool. Once cooled, wrap well in plastic wrap and stick in the freezer for an hour or overnight. When you're ready, preheat the oven to 325. Slice the frozen loaf into thin slices, lay on a cookie sheet, and bake 15-25 minutes, until starting to brown around the edges. Cool on a rack, they will crisp up when they're cool. yay, it's fall! pumpkin time! 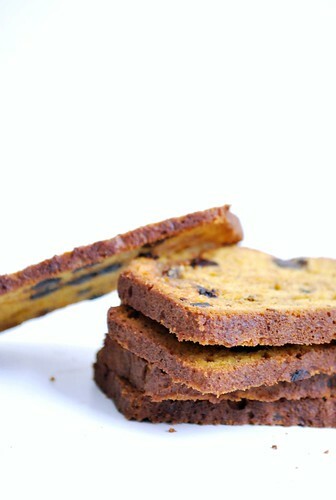 Love biscotti, and with pumpkin inside, its even better =D. Oh, those look great; I am still trying to work up my courage to try pumpkin with chocolate. These might be what finally convinces me to be brave. What a fun gift, too; who wouldn't love getting these?! These look absolutely awesome. I'm definitely making these for my gluten-free friends. I know they'll love them. 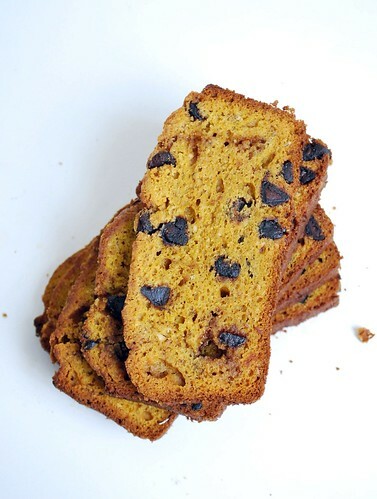 Pumpkin in biscotti sounds amazing. And chocolate chips too? Add a hot chocolate and it sounds like heaven. Nice job! I made them egg-free and dairy-free by using 2 T flax meal mixed with 6 T hot water for flax egg replacer and using Spectrum shortening in lieu of butter. I also added 1/2 cup pecans and switched out sweet potato for the pumpkin (only 'cause I had sweet potato on hand). I also switched up the flour percentages a bit since I don't do the rice flour mix, but it was fairly close to the original. Definitely something I'm going to make repeatedly! I made this yesterday and linked to your blog (borrowed your picture to have people's mouths water). Oh my...amazing! In our high altitude (10,000 ft) I had to bake an extra 10 minutes...but otherwise, perfect to the recipe! These look amazing - one question though... is there a good sub for the almond flour? I'm allergic to nuts so that's a no go. I'm wondering if either upping the rice flour, or using sorghum would work.